Darren Jackson, CEO of Advance Auto Parts, the top financial donor of Building Homes for Heroes®, presented Andy Pujol, president of Building Homes for Heroes® with a check in the amount of $850,000 at its Advance Cares Vendor Golf Classic at the historic Omni Homestead in Hot Springs, Virginia. It's the second consecutive year that Building Homes for Heroes® was named a major beneficiary of the event. The $850,000 marks the largest single dollar donation received by Building Homes for Heroes® since the charity's inception in 2006. The event also marked the 20th anniversary of Advance Auto Parts support of the Juvenile Diabetes Research Foundation. With this donation, Advance Auto Parts has now donated $1.365 million to Building Homes for Heroes®. 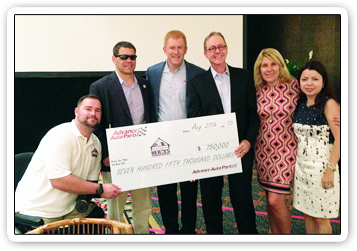 Due in large part to the tremendous generosity displayed by Advance Auto Parts, Building Homes for Heroes® is set to gift 25 homes to veterans in need in both 2013 and 2014. The event featured a day of golf on The Homestead's famed Old Course and Cascades Course, dinner, golf awards, the charity check presentation, comedy by the great Bill Cosby, and a magnificent fireworks show. Building Homes for Heroes® would like to thank Advance Auto Parts for its continued support of the men and women of the military, and its charitable efforts throughout the world. Thank you Advance Auto Parts!